When you look at different camps that kids go to, they’ve often very specific. It’s either basketball camp or soccer camp or tennis camp. Everything is geared to that one sport. It’s the same with practice. Kids have after-school practice so that they can get better at their chosen sport. In other words, the exercises that kids go through are usually all about whatever sport they’ll be working on this season. Our kids’ gym, however, is not just a means to an end. While the goal of football or basketball or baseball is to “win the game,” Hot Ground Gym isn’t a contest. It’s not a game itself, but a way of helping kids grow in many ways. Because it’s about helping the kids grow mentally and physically, what they learn in our after-school program is actually incredibly useful to just about any sport out there. Let’s take a look at what we mean. Baseball can be broken down into four main categories: catching, throwing, batting, and running. Three of those are primary arm-based, which makes baseball an excellent benefactor of a kids time with our kids’ fitness program. The climbing we focus on at Junior Boots strengthens children’s arms and cores, as well as making them more flexible. Of course, the cardio exercise that kids get can help them improve their running ability as well. Plus, the ability to turn on a dime can really help them when they get stuck in a pickle! Half of tennis is running, half is the swing. (We’re sure some tennis masters would argue with us, but we’re going to <ahem> run with it!) Much like in baseball, the arms work we do can certainly build biceps and triceps in order to deliver a more powerful swing. And the constant movement in tennis certainly means that anyone playing will be able to take advantage of the heart-healthy exercise you’ll find at Hot Ground. Perhaps the most important aspect of tennis that our kids’ gym can help with is the need to change direction quickly. After all, you always have to change your path in order to get to the ball, no matter where your opponent hits it. Our obstacle course fitness is also full of direction changes and the need to pivot as necessary. Most people don’t think about the flexibility that’s required with football. But 90% of the players are having to bend down at the line of scrimmage every play, then spring back up at a moment’s notice. Players need to twist around in order to catch the ball, or, like in tennis, need to be able to turn on a dime and change direction. Balance is another big aspect of our kids’ fitness program that can really help with football. A large portion of the obstacle courses you’ll find at Hot Ground Gym will help a child improve balance and proprioception. This is especially helpful for many positions in football, whether it’s a quarterback avoiding a tackle or a running back trying to stay inbounds as he runs the sideline. And hey, jumping can certainly help someone who’s trying to make that final yard over the endzone. Add to the cardio that can help kids sprint for short bursts and you have a program that especially helpful in football. There are few sports that require more exertion than basketball. It’s just constant movement of all 10 players. You can see why the cardio that kids get in Junior Boots can help. Flexibility is another big on, as is the jumping (and landing) that they get at our gym. Arm strength can help as well, considering that stronger you are, the more likely you can hit 3-pointers accurately. Up above we said “There are few sports that require more exertion than basketball.” An argument can be made that hockey is one of those sports. There’s the constant movement of both legs and arms, all while sweating under around 15 pounds of gear. Considering how much action there is on the ice, hockey players really don’t get the respect they deserve; it no wonder they switch out players so often in order to let others rest. Few sports require such a blend of grace and power. Women’s gymnastics, maybe? Anyway, you’re here to find out how Junior Boots can help with Hockey. Balance is really the big one, considering that it takes quite of lot of it in order to skate on ice (both forward and backward). The balance that kids get at our kids’ gym — including recovering when they lose it — can go a long way to helping them in hockey. While baseball favors the arms, you can’t deny that soccer is mostly about the legs and feet. Good thing we exercise them well here at Hot Ground! If you take a look at the video on our home page, you can really see how the amount of leg work we do can help someone in soccer. It might be the improved flexibility, the recovery from changing direction, or the sheer ability to run…they all come together to make someone better at what most of the world calls football. We hope we’ve convinced you that Junior Boots can help with just about any sport out there, including many that we didn’t include on this list. 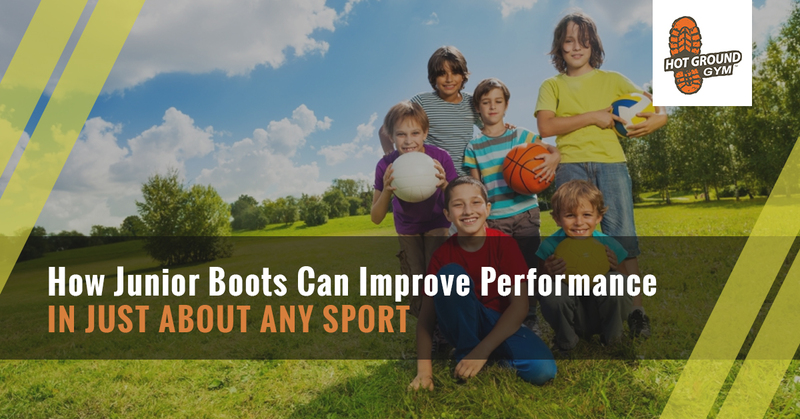 When you bring together the increased flexibility that kids will enjoy, coupled with the turn-on-a-dime obstacle coursework and increased muscle mass, it’s easy to see just how Junior Boots can help kids season after season no matter the sport they play. Check out our schedule here; we look forward to helping your child improve their sporting abilities!